Drew Brees and the New Orleans Saints torched the Tampa Bay Buccaneers on Sunday, 30-10 from the Mercedes Benz Superdome, in a game that was seemingly in hand for the Saints after a blocked punt was returned for a touchdown and a 9-0 lead in the first quarter. Brees connected on his first six pass attempts and finished the game with 263 yards through the air and two touchdowns in the rout. Rookie RB Alvin Kamara made amends for an early fumble in this one, touting the ball 10 times for 68 yards and a touchdown, while hauling in six receptions for 84 yards and another score. His highlight-reel screen pass that he took to the house from 33 yards out pushed the Saints lead to 16-3 at halftime. New Orleans added two touchdowns in a span of :20 seconds in the third quarter to pad the lead to 30-3 as the Saints didn’t look back. On the other side of the ball, Bucs QB Jameis Winston was knocked out of this game, re-injuring his throwing shoulder and journeyman QB Ryan Fitzpatrick filled in for the former Heisman Trophy winner valiantly once again, throwing for 68 yards and the Bucs first touchdown in eight quarters of football, on a throw to Luke Stocker for a score in the final quarter. Brees finished 22-of-27 for 263 yards with a sack and a dropped pass, and he also had a fumble on a sack and very nearly threw an interception to Lavonte David in the first half. While most of Brees’ completions were of short or intermediate range, he did complete two deep passes including a beautiful touchdown on a seam route to put the game away. Brees was 3-of-3 on play action passes for 62 yards and had a touchdown as well. Ginn caught all four catchable passes thrown his way for 59 yards and a touchdown. Ginn connected with Brees for a deep completion of 36 yards running a seam route to effectively put the Bucs away. Making the most of his three pass-rushing snaps, Bell got to the quarterback twice with a sack and a QB hit. The former Ohio State Buckeye was excellent in coverage as he broke up a pass while allowing just two catches on three targets for 15 yards. The second-year player has had an up and down short career but broke through with his best game yet against Tampa Bay. The former Arizona Cardinal is having a career-year as Okafor has already matched his sack total (four) from 2016 while doubling his QB hits to two. Against Tampa Bay, Okafor racked up a sack, two hits, and two hurries while also getting four defensive stops. Okafor has been great as a pass-rusher but arguably more impressive as a run stopper as his 9.5 run stop percentage ranks second among all qualifying 4-3 defensive ends. The combined performance from the most important position on the football field was difficult to watch as neither quarterback was able to create big plays down the field or run the offense efficiently with short and intermediate passes. Throwing deep, Winston missed on all four of his attempts while Fitzpatrick missed on both of his, while each completed just one pass thrown in the intermediate range (10-19 yards). Both quarterbacks were pressured on eight dropbacks while Fitzpatrick completed just one pass for 15 yards and Winston completing two for 18 yards. All in all, neither quarterback had any success against a New Orleans Saints defense that has been playing at an elite level since their week 2 loss to New England. The lone bright spot on the Buccaneers offense was Dotson who has been one of the best offensive taclkes in the NFL this season allowing just two QB hits and five hurries while being one of seven starters to not allow a sack this season. That ended against New Orleans but it was the only blemish on his 38 pass blocking snaps. Dotson struggled a little in run blocking but on a day where the rest of the offensive line was beat up by the Saints front seven, Dotson stood out. McCoy played well on the defensive interior for the Bucs as he had a stop and two tackles in run defense while adding a pressure rushing the passer. Limited bright spots on a day with very few from the Bucs as a whole. Ayers had a sack and a hit rushing the passer while adding three stops in run defense. 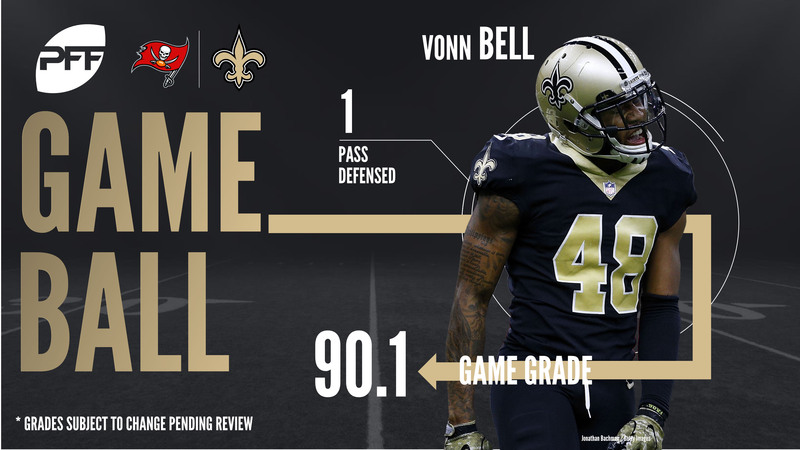 Overall, the Bucs defense got pushed around by the Saints running game and left recievers open on the back end as they struggled to stop New Orleans offensive attack.